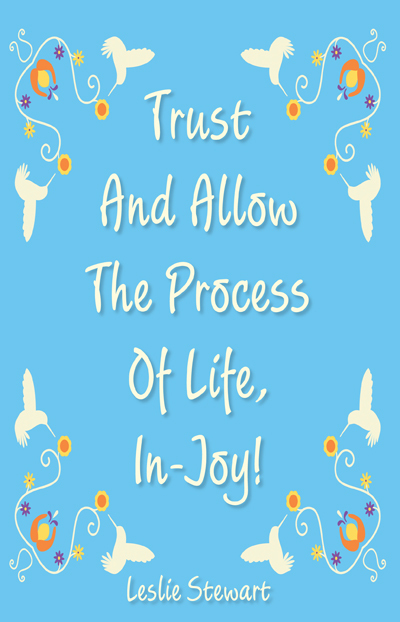 Trust and Allow The Process Of Life, In-Joy! Leslie Stewart, author and channeler of Orion, will be a featured speaker at The Victory of Light Expo, Cincinnati’s premier Body, Mind & Spirit event since 1992. The Expo will be held at the Sharonville Convention Center on November 22nd & 23rd from 10:00 am to 7 pm. See events page for more information. This seminar will explore the strong possibility that long-term chronic stress, a lifetime of emotional instability, and “resisting life” all play a major role in damaging the immune system, consequently causing autoimmune dis-ease and perhaps Alzheimer’s. The information that will be presented offers hope for prevention and perhaps future cures for these dis-eases with the new progressive science of neuroplasticity and epigenetics. Receive joyful inspiration, insightful information and loving support from a collective consciousness called ORION (who is similar to Abraham/Seth), channeled through Leslie Stewart. Orion reminds us that we are more than our physical selves, that we are connected to greater parts of our multidimensional selves, and that we have the potential to create worlds. Come learn practical ways to align with your true nature! The channeling will be followed by a book signing. Receive joyful inspiration, insightful information, and loving support from a collective consciousness called Orion (who is similar to Abraham/Seth), channeled through Leslie Stewart. Orion reminds us that we are more than our physical selves and that we are connected to greater parts of our multidimensional selves that have the potential to create worlds. Come learn practical ways to align with your true nature! This event is over. See latest posts for new events. February 25th from 7-9 pm. Orion and Leslie Stewart will be introducing their new book Trust and Allow the Process of Life- In-Joy! Leslie will also be available for private individual sessions the week of February 23rd.